NFL Tight End Aaron Hernandez Charged With Murder : The Two-Way State and local police arrested Aaron Hernandez, 23, at his North Attleboro, Mass., home Wednesday. He was arraigned in Attleboro District Court on charges of first-degree murder and five gun-related crimes. 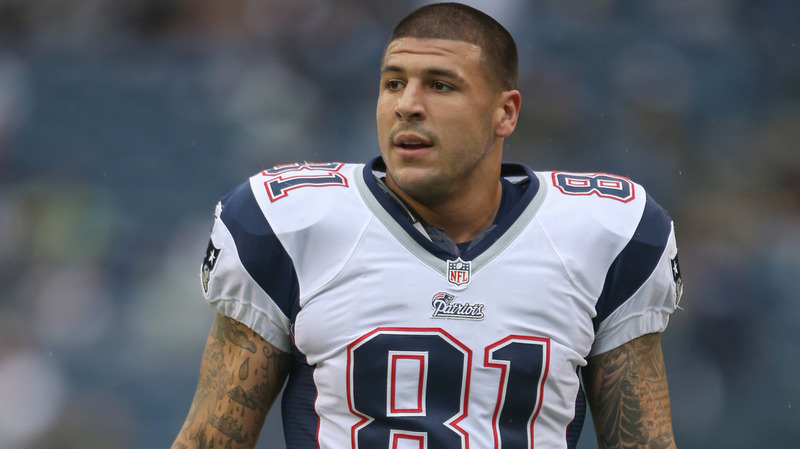 Aaron Hernandez was cut by the New England Patriots after he was arrested Wednesday. Hernandez faces first-degree murder charges in the death of Odin Lloyd, 27. Pro football player Aaron Hernandez, who until today was a member of the New England Patriots, was charged with murder and other crimes in a Massachusetts courtroom Wednesday. He was arrested this morning and formally charged this afternoon, with authorities blaming him for the death of Odin Lloyd, 27, whose body was found on June 17. A judge has ordered that Hernandez be held without bail. Hernandez lives in North Attleboro, Mass., where state and local police arrested him at his house early Wednesday. He was arraigned in Attleboro District Court on charges of first-degree murder and five gun-related crimes in connection with the death of Lloyd, who had been shot. After outlining their investigation for 25 minutes, prosecutors said "the evidence shows the defendant had the motives and the means to commit the crime." The evidence reportedly includes surveillance footage, cellphone text messages, rental car records and elements of the crime scene. Hernandez's attorney, Michael Fee, calls the evidence "circumstantial," saying that the case against his client was "not strong." Hernandez is next due in court on July 24. A tight end, the 23-year-old Hernandez is a three-year veteran of the NFL. After a standout career at the University of Florida, he was drafted by the Patriots in 2010. He played in the NFL's Pro Bowl and signed a $40 million contract extension with the Patriots last year. "A young man was murdered last week and we extend our sympathies to the family and friends who mourn his loss. Words cannot express the disappointment we feel knowing that one of our players was arrested as a result of this investigation. We realize that law enforcement investigations into this matter are ongoing. We support their efforts and respect the process. At this time, we believe this transaction is simply the right thing to do." "The involvement of an NFL player in a case of this nature is deeply troubling. The Patriots have released Aaron Hernandez, who will have his day in court. At the same time, we should not forget the young man who was the victim in this case and take this opportunity to extend our deepest sympathy to Odin Lloyd's family and friends."